I bought this book back in January (I think), and I only just got around to reading it now. I'm sorry I waited so long, since I loved this book! I knew of Grant Lawrence from being an avid CBC radio listener; and last summer some of the stories that made up this book were played as audio pieces in local programs across Canada. I loved the stories, and his story-telling style, but I can't stand his voice. So this book was the perfect compromise. The stories are there, along with their humour and tragedy; but without the voice. Desolation Sound is on the BC coast, north of Vancouver, and when Grant Lawrence was a child (a very nerdy, mal-adjusted child), his outdoor-loving father decided to buy a large plot of land, and subdivide it for cottages keeping the original site for his family. The first half of the book is the story of Grant growing up and growing into himself; learning to eventually enjoy his time at the cottage every summer after a rough beginning. This half ends with teenage rebellion, and his refusal to have anything to do with his family and the cottage. The second half of the book then deals with him re-discovering the cottage and his love for it as an adult. Here, he is going back with his friends, and meeting the neighbours who have moved into the cottages in the area. The whole book is interspersed with back-stories of the neighbours, stories of the history of the area, and stories of the geography. Why did I love the book so much? The stories were intriguing, the book was well paced, and the book made me laugh out loud at times, and cry at others (I finished it on the airplane a few weeks ago, and yes, I did cry at the end). 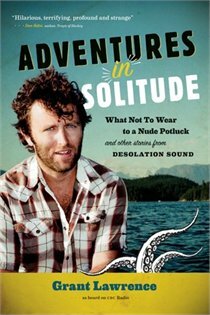 And above all, this book made me really, really want to visit Desolation Sound. It sounds absolutely breathtaking! My favourite quote from the book came not from Grant Lawrence, but from a quote that he included at the beginning. "Language has created the word 'loneliness' to express the pain of being alone. And it has created the word 'solitude' to express the glory of being alone." (Paul Johannes Tillich). I don't like loneliness, but I love solitude. One of my favourite memories from last summer came from a day spent paddling my canoe by myself through the wilderness of Quetico Park - glorious solitude, but not an ounce of loneliness. I guess this is a rave review! I loved this book so much that I gave my copy away to my sister as soon as I finished it since I think that she and her husband will both enjoy reading it as well. oh wow, i'd been looking for good new books to read and this seems really interesting and thought provoking. or at the very least fun. definitely putting this on my list. Knight - do find yourself a copy - it is definitely worth a read.